Do you forget to do your monthly chores? You are not alone. I have forgotten these monthly chores a lot and before I know it the whole house is sneezing and experiencing watery eyes. It’s because these chores are done so infrequently that they are often forgotten. Not doing them, though, can cause certain allergies to flare up. Today though I have a FREE monthly chores checklist for you to help you remember. I highly recommend splitting up these monthly chores over the course of the month in order to make it less overwhelming. Some of these you can even add to your normal wipe downs and cleaning. However, if needed you can complete all these chores in a full day or a weekend. So if you find yourself in the midst of a busy month and can’t add this to a daily or weekly schedule you can do it all at the same time. The goal with monthly chores is to do them as needed. If you see that one of these isn’t really necessary it will be ok if you skip it one month. These chores are based on a house of 3 adults, 1 preschooler, and 2 cats. You may find a couple of them to be unnecessary for every month if your home situation is different. Once a month you should go through and deep clean your big and small appliances. I worked in a restaurant for years. The great restaurants remove nozzles on soda machines, clean out their toasters, and clean out their ice bins regularly. Just like in a restaurant all small appliances need to be cleaned just as much as the bigger ones. Toaster – Empty it out and wipe it down. Stove Top – Clean burner grates, burner covers, and clear the surface of crumbs and grease. Oven – Clean your racks and clear all debris and grease from inside. Microwave – Remove and clean the inside of your microwave and door. Coffee Maker – Run a vinegar water 50/50 mix through the brewer. Rinse with two or three more plain water brews. Dishwasher – Remove racks and wipe out the inside and clear the drain. Replace the racks and run a measuring cup with vinegar through the wash. I find that I can usually just add this to my weekly big kitchen cleaning. The one where I pull the small appliances forward and get absolutely every crumb out from under them and when I wash the kitchen floors. Since I’m already massively cleaning my stove top and scrubbing it once a month I add this type of cleaning too. Every month you will want to go through and spot clean your walls. Check near doors, near where shoes come off, and near light switches for fingerprints. You’ll also want to look behind your sink for food and dirty water splashes. Also makes sure you look low on the wall for animal drool or spilled food from your kids. Use a Mr. Clean Magic Eraser or a mild all purpose cleaner and a rag. Make sure you test whatever product you use in an inconspicuous location to make sure it doesn’t mess up your paint. We often forget to dust behind our electronics and this can end up being costly. Electronics need to breath and they often end up having dust come in through vents. This dust causes your electronics to choke, overheat, and stop working. Cleaning out the dust underneath and behind your electronics helps to make sure that they stay in good working condition. If needed open up the cases of your computer and use compressed air to clean out the inside. I add this one to one of my weekly dusting sessions. It doesn’t take much time to add it to that part of my schedule. There are several ways that you can clean out under appliances to keep them in good working condition. You can either move the appliances with the help of someone else but this requires making sure you are watching the gas or water lines. The other is to remove the bottom drawer, grates, or panels and using the hose on your vacuum to clean out. I don’t often move the actual appliance I leave that for Spring and Fall cleanings. Most of the time I just remove the bottom drawer, panel or grate to clean underneath. It’s easier and doesn’t require two people. I add this chore to one of the kitchen cleanings that requires a floor cleaning too. It usually ads about 30 minutes on to that weekly chore. Once a month you should go through and deep clean your bathroom. This isn’t the normal wipe down that you do every week. This is where you scrub grout, shower heads, and clean under and behind your toilet. This deep cleaning once a month prevents the spread of germs and makes sure that the place where you get clean stays germ free. Once a month when I’m doing my major bathroom cleaning I turn it into a deep clean. I might spend an extra 20 minutes really making my bathroom shine with this monthly deep clean. Your cabinet fronts will get water splashed on them, food splashed on them, and see a lot of action throughout a month. It’s important to wipe down your cabinet fronts with cleaner to sanitize them and clean them up. There are several different ways to clean your cabinets and they all depend on the type of cabinets you have. I personally prefer using a Mr. Clean Magic Eraser for laminate cabinets or Murphy’s Oil Soap for wood cabinets. I have always had animals in my house. When you have animals you have fur. That fur likes to collect on the fronts of the air intakes in your home. Use a vacuum to clean the front of the vent. If needed open it up and vacuum out the inside too. Keeping these intakes clear of debris helps to keep the air in your home cleaner so that your family can breath easily. When I am already vacuuming the house I will take the hose and vacuum off the air intakes too. My child often spills things on our sofa so a spot cleaning every month with a major cleaning twice a year keeps it clean. Spot cleaning depends totally on the fabric that you have on your sofa. Consider getting an upholstery cleaner for spot cleaning. I personally like using baby wipes for most food stains. They are gentle on the fabric, clean up spilled things, and are readily available. I usually add this to my regular tidy. I usually end up doing it about twice a month and it only takes an extra 5 minutes of time with my baby wipe trick. Cleaning your railings, door knobs, handles, and banisters removes dirt and sanitizes for a healthy home and family. When you aren’t looking you’d probably be surprised about the amount of dirt little hands put on a railing. Between germs, sticky fingers, dirt and dust, your railings and everything else need at least monthly cleanings. I personally use the Mr. Clean Magic Eraser again because it cleans them quickly and easily. I really love this product. A monthly cleaning schedule allows you to go through your home with a fine tooth comb so you can keep it cleaner longer. My monthly cleaning schedule is part of the reason why I can be ok with tidy not perfect. Tidy not perfect is how I keep cleaning stress free. I built up good cleaning habits that keep my home tidy every day. Then once a week I vacuum, dust, wash windows, and do a deep clean of my kitchen. A monthly cleaning schedule like this helps make keeping your home tidy a lot easier while not taking up loads of time. We are busy, right? We don’t need cleaning to take over our lives. 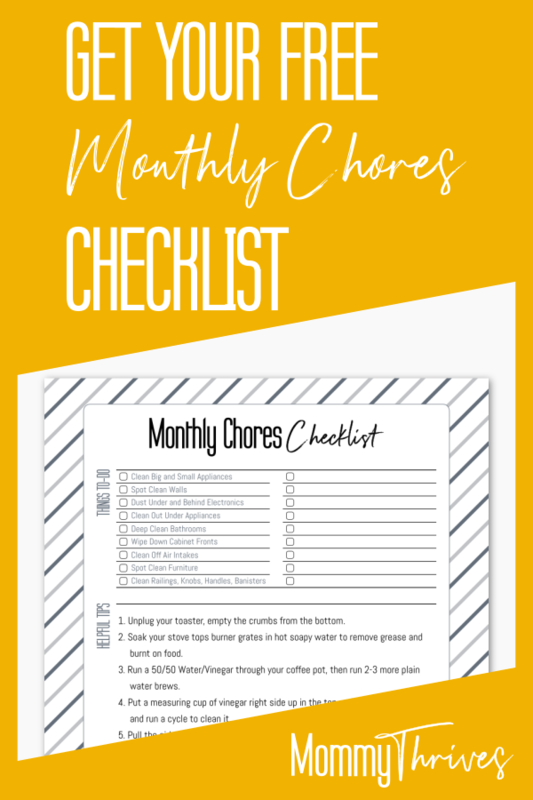 Below is a monthly cleaning checklist that has all of the chores that should be done monthly plus helpful tips to make cleaning a lot easier. If you do a monthly deep clean all at once or scattered with your normal quick tidy and weekly cleaning schedules you’ll want this handy reminder. Simply check off the boxes of the things you’ve completed throughout the month. There are also loads of helpful tips on the checklist that will help make cleaning easier. Plus there is space to add and adjust for your needed monthly chores. What are some chores that you only do once a month? Let me know in the comments below. Follow me on Pinterest for more like this and pin this to your cleaning boards.